About Us | Central Bookkeeping & Tax Service Inc.
At Central Bookkeeping & Tax Service, EA’s, provide affordable and exceptional accounting and tax services. The majority of our business is concentrated in tax preparation with 1040’s, businesses, and rentals. We also prepare partnerships, LLC’s, and S and C Corporations. We strongly believe in the value of relationships. We believe that each client relationship is like a partnership. After all, we measure our success on that of the success of our clients. Central Bookkeeping and Tax Service was founded in 1965 by Hilda Carpenter. She began her financial career at a young age working at a local bank and soon found her niche for numbers. Her husband, Robert Carpenter, was a sales manager with Xerox, and later joined the business practice in 1973. They both have Enrolled Agent certifications serving the central coast for over 30 years. In December of 1980, their son Nick Carpenter was born. 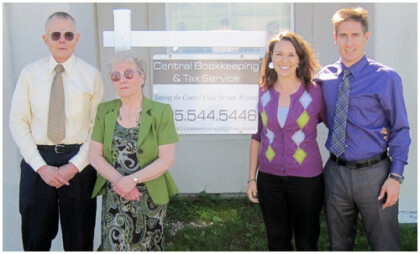 In 2003, Central Bookkeeping and Tax Service expanded their family business with Nick Carpenter. He has thoroughly demonstrated to be a valuable asset to the business with his array of expertise of accounting, bookkeeping and tax preparation. With his wife, Monica’s support, they work diligently to reach their goal to stream-line every avenue of the business. As a result, a superior client tax experience. Nick Carpenter is also a ambassador for the Paso Robles Chamber of Commerce. As of 2011, Nick is also an Enrolled Agent of the Internal Revenue Service.